A Barnsley Historian's View: Get a website! or a blog! They're free and very easy to use, must be, I have three! Get a website! or a blog! They're free and very easy to use, must be, I have three! When a place or organisation has a website you can look it up, check it out, look for reviews and comments. When they have a calendar online you can check that the event or occasion you are going to is when you think it is. You can see if there is an entrance charge or restrictions on entry (no children, disability access). When they have address details or a map you can see where exactly it is taking place and work out a plan for getting there on time. Reviews and positive comments add to your confidence in going to a place or event for the first time. Without a website what did we used to do? We used to ring up. But the phone book no longer has everyone in it. And little organisations don't have contact phone numbers any more. We used to look at the event or venue in a newspaper advert or in a diary column in the local paper - but people don't take them out for everything. We used to ask in the local tourist information - which is alright if you have one or know its phone number and if they have the contacts you want. We used to ask a friend - but that's not much use if your friends haven't been there either. In my busy social life (ha!) I have just run across two contrasting instances of the above. One a talk organised by the Barnsley Civic Trust about Canals and one a birthday meal out with friends. The venue for the birthday meal was suggested by the OH - he's keen on the pub (well, being a CAMRA member he's keen on a lot of pubs! ), but my friend GB (whose birthday it will be) and I have not been there before so I was unable to answer any of her questions about the place. However this morning she emailed me, reassured, because she'd been able to find details and favourable reviews of the pub/restaurant we are planning to go to online. Hooray! A week or so ago we (GB and I) attended a Barnsley Heritage Forum meeting along with representatives of many other Barnsley groups. We introduced ourselves around the table giving details of forthcoming events and plans for the future. Many did not have a website. Some did not even have email contact addresses. I noted down the details of a talk from Barnsley Civic Trust which was going to be held above the White Bear. 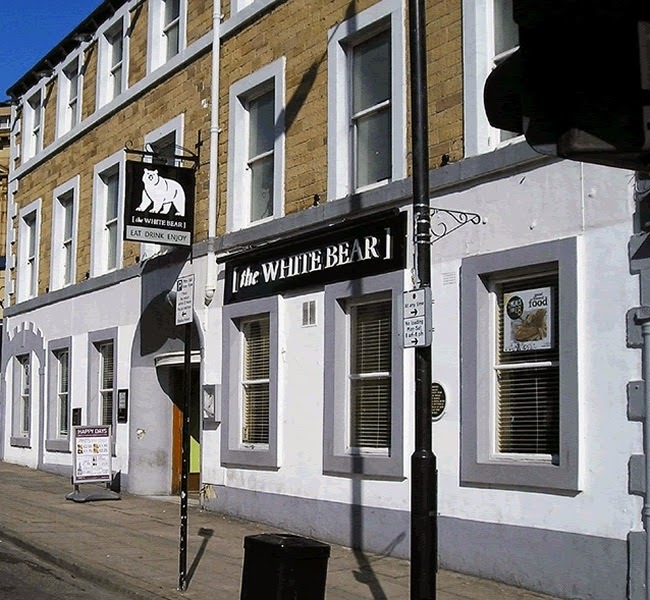 For those of you who don't know Barnsley the White Bear (note how I've included a weblink at this point so you can look it up yourselves) is a trendy, foody pub opposite the Town Hall, popular with students from the nearby University (yes, we have a University in Barnsley!) and quite nicely done up fairly recently - I went in there a few times when I was doing my PGCE three years ago. Its write up, however, is not very conducive to academic historical talks about canals so I must admit GB and I were a bit baffled about this as a venue. I tried searching for the Barnsley Civic Trust online - no webpage. They do have someone who tweets - @BarnsCivicTrust and there were a couple of tweets about the talk so at least I was able to confirm that it was going ahead. But I still didn't know how to access the venue, or whether there was a door charge or how long it was going to last. I had arranged to meet GB at the pub ... the OH took me in the car and as he pulled up outside he said, "Do you know where you are going?". Well, no not really, I was just going to go into the pub and ask. He parked the car up and got out - he led me down the side of the pub (a bit seedy to be honest) and to a fire escape type door with a huge flight of steps inside. "Up there," he said. Really ... I wasn't sure and I didn't like the look of the steps, but he was confident that that was where I wanted to be. I shouldn't have doubted him - he was quite right. GB was already there, she'd done the 'asking in the pub' thing I had been planning. It was actually a very nice room, large, with plush chairs, a dance floor and a little bar - just the thing for a birthday party or small wedding reception. And quite good for a talk on Canals too. Very interesting. There was no door charge, but those stairs would have made the venue inaccessible to me on a bad day and given the average age of the other attendees (high) I think it is an important point. The talk finished at 8:30pm, which was OK, but I did have to wait nearly half an hour for a bus home as they are only once an hour now. I could have made a better plan if I'd had more details in advance. So, my point is, to get maximum publicity and attendance at an event, to reach more people with your ideas and plans, follow the example of businesses by having a good online presence. It's really not hard these days.